sewing the seeds of love: Giraffes and ballerinas. I love the arrival of a new baby ...great excuse to make a cutesy quilt ! In this case, baby Eva's mum Mel has a penchant for giraffes so a combination of the giraffe from the Noah's Ark pattern with some vibrant pinwheels and voila ! Mel was so excited to receive this pink quilt from our quilt group..after two boys the colour is a great change from blue and army green . This weekend was spent indoors escaping the chilly, rainy weather. 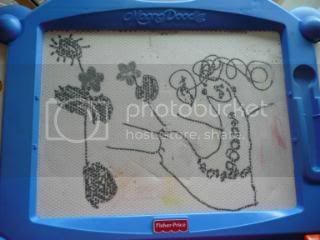 Emily took to drawing on the magna-doodle ( a hand-me- down toy from her brother which has seen better days ). it is of a ballerina prancing across the dance floor (her words) . Just too cute and not a bad effort for a 3 yr old. Funny how girls can be amused for hours drawing and colouring from early in life. The boys that I have known do not seem to be able to sit still as long the girls..too many jumping beans. Hope you enjoyed your weekend. We did ! 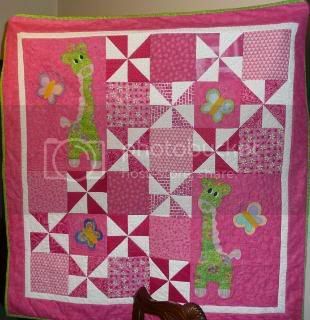 The giraffe quilt is beautiful...very inspiring! What a fabulous quilt! I love the giraffes. And of course, it is pink! I love the ballerina drawing!! !